Homeopathic medicine for the temporary relief of nasal and sinus congestion. Gently clears your stuffy nose and sinuses! Stress and exhaustion during the wet and cold times of the year encourage viruses and bacteria to accumulate on the mucous membranes of the respiratory tract. In many cases, viruses cause an inflammatory reaction in the nasal mucosa, associated with a swelling of the mucous membranes which, in turn, reduces mucous drainage. Symptoms include an inflamed, congested nose and painful pressure in the head. 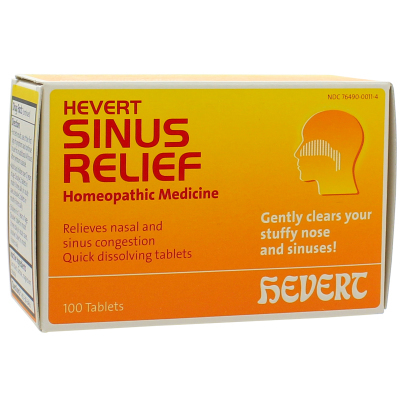 -Hevert Sinus Relief has a decongestant and regenerative effect on the nasal mucosa, resulting in the discharge of stubborn mucus. -Accompanying symptoms such as sinus pressure, sneezing and runny nose are relieved. -Hevert Sinus Relief is also suitable for children aged 6 years and over and for people with sensitive stomachs. It works without stressing the body with high doses of chemical substances. -It makes good sense to use Hevert Sinus Relief in addition to antibiotic treatment prescribed by a doctor because the homeopathic medicine contributes to the recovery process in a different manner. -For best results, use at the first sign of symptoms and continue to use for an additional 48 hours after symptoms subside. of age: Dissolve 2 tablets in mouth 3 times daily. In acute cases, dissolve 2 tablets in mouth 6 times daily.